Stunning and modern Vireo II end unit, in the convenient Third Ward District! 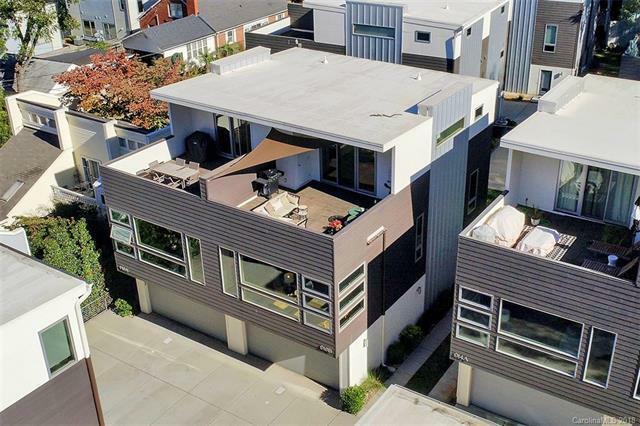 This home boasts breathtaking views of the city from a top floor terrace, and is the perfect spot for entertaining guests while taking in the city scene, or heading over to a Panthers game. You will not want to miss this rare opportunity for a home with such superior craftsmanship. No details were overlooked, including pocket doors throughout, open riser stairs, architectural metal handrails, spa master shower, soft close throughout the home, polished concrete floors as well as gleaming hardwoods, gas cook, vessel sink, tankless water heater, and even a sail shade to provide coverage while enjoying the impressive terrace area. Home is located down the street from Frazier Park and Irwin and Stewarts Creek Greenways. Sellers are providing a 1-year home warranty from 2-10. This is definitely a must see - look no further for your perfect uptown home! Tax Value reflects newly assessed value pending any appeals. Sold by Reside Realty Llc.